Whether you are a working family with needs to bring more order to your living space, or senior citizens moving home and downsizing, or bereaved family with needs for preparing home for sale, or business lacking functional space, we will assess your space and provide customized and confidential solutions. To help you stay on top of things, we also offer after care for each project and regular maintenance service. If you interested in doing it yourself, please check our organising and decluttering course. Is your home filled with clutter? Do you dread opening your hall cupboard? Do you constantly find yourself thinking 'I need more storage'? I can help. 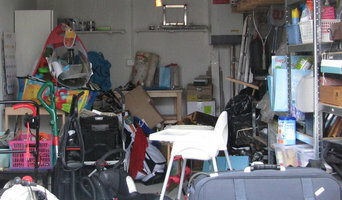 I work with clients one-on-one to rid your home of clutter. Over the course of a half day or a full day we take everything out and together we decide what you want to keep and what you want to get rid of. We take the process at your pace and I won't make you get rid of anything, it will be your choice. Generally clients discard between 5-10 bags during a session, would it feel good to get rid of that much stuff? I love helping people create time and space for the things they really want to do, let's banish the clutter for good! Experts in home organisation can help streamline and organise your home life. They provide bespoke storage solutions and strategies to ensure everything in your Heriot, Scottish Borders, UK home has a place and you can live comfortably. Some can help you regain control of your entire house, while others specialise in specific areas, such as wardrobes, offices, paperwork and collections. They also provide coaching so that you can maintain your new organised space. Find a wardrobe, storage and organisation expert on Houzz. Scroll through this page to find Heriot, Scottish Borders, UK professionals who can design and install storage solutions, as well as provide home organisation services. You can browse their previous work, read reviews and see how other homeowners rate their customer service, product and expertise.